I fear that there is only so much complexity I can take. Not long ago, if you wanted to learn about wine you studied France, Italy, Spain and Germany. Even that adds up to a lot of information, frankly. Now you’ve got the Americas, South Africa, Australia and New Zealand, eastern Europe coming up the rails, the promise of Asia, some action in north Africa, even dear old Blighty. Hundreds of grape varieties, thousands of wine-growing areas, gazillions of different styles. Even once you’ve decided on what you want to drink, you’ve still got to get it into your mouth – and that’s not as straightforward as it sounds. Most people would agree that wine should go from the bottle into some kind of glass or cup before it is consumed. And most of us would agree that a decent wine glass would be the recepticle of choice. Fine, great. I’ve got some decent wine glasses. So I’m good, right? I’m all sorted? A couple of weeks ago Maximilian J Riedel, 11th generation scion of the German glass-making dynasty, convinced me that I’m not. In fact, I’m some way from being good. And I don’t think there’s anything I can do about it. He has been hosting a series of tutored tastings, in London and around the world, aimed at showing wine-lovers how good he is at swirling wine in a glass (amazing – so elegant! And with such nonchalance!) and more importantly that they need to spend lots of money on loads of glasses. Of course, he would say that – his company makes glasses (other glass manufacturers are available). But dammit if he isn’t actually right. At my tasting we tried two wines in a variety of glasses. With one, a Berton Estate Reserve Cabernet Sauvignon from 2007, there was a noticeable difference when it was drunk from the appropriate vessel, but frankly not one that would have me running to my nearest glass-purveyor waving an open wallet. With the other, a Coniglio 2002 chardonnay from Hawkes Bay, the improvement when drunk from a specialised chardonnay glass was frankly astonishing, revelatory. In the “wrong” glasses there was too much acidity, nudging towards harshness; in Riedel’s Montrachet glass it woke up, and what was clearly a good wine showed itself to be a stonker – possibly my all-time favourite New World chardonnay, in fact. At upwards of £25 a bottle it should be good, but in the right glass it improved by perhaps 15-20%; perhaps a finer, more complex red – the Berton costs around £9 a bottle – would have proved its point a little more forcefully as well. “If you want to enjoy wine at its best, we believe that you need to have the right messenger, the right glass,” Riedel told us. And they’ve got lots of messengers. 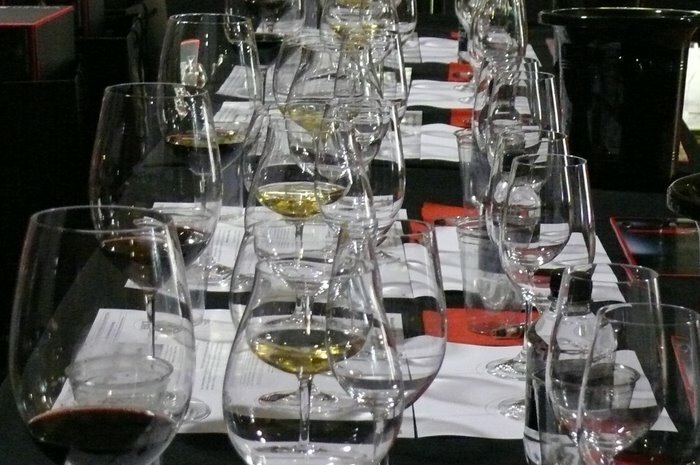 The standard Vinum range – and this is just dipping a toe into a sea of complexity – has a glass for aged chardonnay, another for young chardonnay, and further glasses for Brunello, Burgundy, Bordeaux blends, syrah, tempranillo, zinfandel, sauvignon blanc, champagne, extra-special champagne, riesling, kalterer see auslese (nope, me neither) and “young, fruity, acidic, dry light white wines with less than 12% alcohol”, plus many others for sake and all sorts of spirits and fortifieds. The science bit, such as it is: Riedel showed us that different glasses deliver the liquid into your mouth in a different shape, apparently altering the way your tongue decodes them. True enough, when you put some chardonnay in a riesling glass the liquid looks like the top of the Gherkin as it arrives in your mouth, while in the Montrachet (right) glass, it is rounded like half a football. They also change the way you perceive smell, apparently, but that you can’t see so much. So the glasses work, then. But with an RRP between £15 and £20 apiece (these are machine-blown glasses, nowhere near the top of Riedel’s range), if I had to kit myself out for all the different wines I might expect to drink I’d be straight down the pawn shop with the PlayStation and Mrs CF’s engagement ring. And then I’d have to build a new extension just to house them. So what to do? Oh hang on, Maximilian’s holding a decanter. “Every wine must be decanted,” he says. “Red and white and Champagne.” I have one decanter, which I got for Christmas and use once or twice a month. He pours us two glasses of the same wine – a Chianti Classico – one from a decanter and the other from the bottle, but I am unconvinced that decanting made much of a difference. 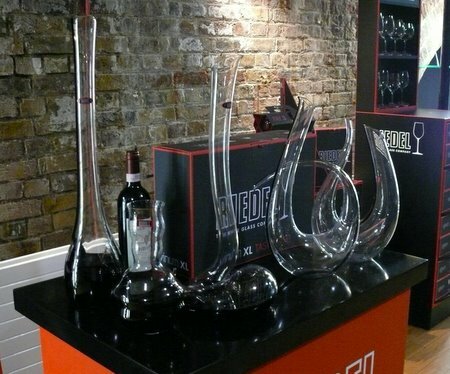 “I wouldn’t say it changes the wine,” he says, “but it makes it mature.” Riedel’s favourite decanter, named Eve after his mother and designed by him in 2008, is over 50cm high, costs £375 and comes with an instructional DVD. A lot of their stemware is beautiful in its elegance and simplicity, but some of Riedel’s decanters are ostentatious to the point of absurdity. Have you got a cupboard for this lot? It is interesting that while Riedel have been selling these glasses for 30 years and more, there is still no clear consensus in the wine world. Most restaurants, even the very finest, use one glass for all styles of (dry, still) white wine and another for all the reds. Yesterday I was talking to one of the people behind 28-50, the new wine-focused restaurant off Fleet Street (more of which another day), and though they have more different glasses than most he was very sceptical about Riedel’s ideas. Whatever the merits of his argument – and I am convinced that there are plenty – I have neither the finances nor the storage to launch myself down the Riedel route. And so I must continue to use the wrong messengers, and hope my wines shout loudly enough for me to hear them anyway. And I fear there is a point where the world of wine reveals itself to be so complex that all but the most determined of explorers simply gives up, waves a little white flag and goes and gets himself a pint of lager (though even that isn’t always so simple). But from now on, until I take out a second mortgage and build that glass-storage extension, whenever I drink wine at home (except for the two varietals I happen to have the right glasses for) I’ll wonder if it could taste 15-20% better. This does not make me happy. At all. This entry was posted in Uncategorized and tagged glasses, Riedel, wine glasses. Bookmark the permalink. I met Max’s dad, Georg earlier this year – http://bythebottle.co.uk/archives/265. I’m afraid I am far more easily won over than you… I have managed to acquire three of each of the Pinot Noir, Montrachet, Riesling, Sauvignon Blanc and Cabernet Sauvignon glasses, plus a super-sized decanter (Why three? Long, boring story). However, they all live in the cupboard under the stairs – still in their boxes – reserved for very special wines, because (a) the kitchen can’t accommodate them and (b) I am terrified of breaking one. Sad, eh? I love your pictorial guide to glass shapes! I expect to see it used in Max’s future presentations……. Nice to have met you and no doubt we’ll meet at another event.